Cities in this region may appear unique today, but like most cities around the world, the vast majority of them grew out of settlements that had access to enough water to sustain life. This is not to say the region’s cities only grew around water sources, for many have other favorable geographical characteristics, too. Many of the region’s cities benefited – and still benefit – from proximity to a water body that moderates their temperature. Quite a few benefited from a geography that allows natural ports: these include Alexandria, Algiers, Tangier, Jeddah, Aden, Haifa, Acre, Byblos, Casablanca, Tunis, Muscat, and Manama. Others – such as Doha, Dubai, Kuwait – began their lives as small pearling ports. Some regional cities benefited from proximity to land trade routes (Aleppo, Marrakesh, Nablus, and Sana’a); others grew near large navigable rivers (Cairo, Baghdad, Mosul, Basrah, Raqqah). In some cases, cities grew in locations where the climate was more temperate due to altitude (Amman, Aleppo, Sana’a, Taif). In at least two cases – Jerusalem and Mecca – it was spiritual significance that drove city growth after the discovery of a water spring. One factor remains constant in the development of all these cities, though, none of them would have been possible without access to fresh water, be that ground water (wells and springs), surface water (rivers and streams), or direct rainfall. The region’s cities are where they are because of water, not despite the lack of it. Damascus and the Barada River. Copyrights: Google. In the more temperate parts of the region, where the terrain and climate permitted, cities emerged around small local rivers, springs, and groundwater aquifers recharged by precipitation on nearby mountains. This is quite common in both the Levant (comprising Lebanon, Syria, Jordan, Israel and Palestine) and the Maghreb (including Tunisia, Algeria, and Morocco). 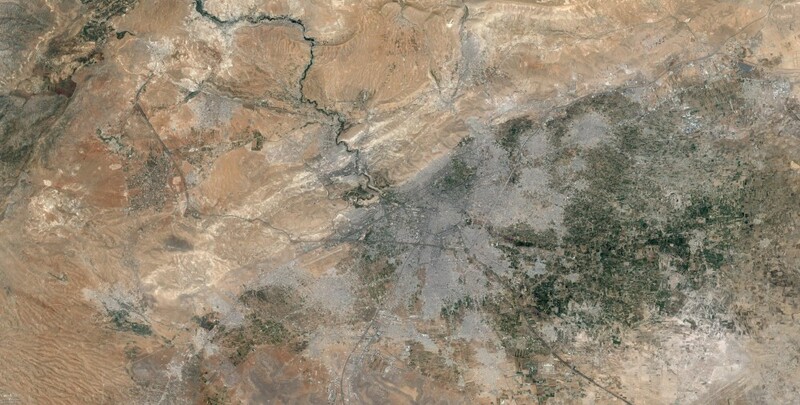 Cities that developed alongside small rivers include Damascus, which grew on the banks of the Barada river, which originates in the Anti-Lebanon mountains less than 20 miles away. They also include Syrian cities such as Hims and Hama which grew along the Orontes river that flows northwards from the Anti-Lebanon (Qalamoon) mountains through Syria and Turkey until it reaches the Mediterranean Sea. In north Africa, the Moroccan coastal urban agglomeration of Rabat/Salé grew around the banks of the Bou Regreg river which flows from the Middle Atlas mountains, 50 miles away, while the old city of Fez was built within the Sais plain around the Jawhar (Fez) river and benefited from the many tributaries that flow from the Atlas mountains to its north, east, and south. Cities that developed above fresh groundwater include Marrakesh which was located above an aquifer that gets recharged by snow melt from the Atlas mountains 30 miles away. They also include Beirut and the Palestinian cities of Jericho and Beersheba. The coastal city of Beirut first emerged on flatlands with freshwater wells fed by Mount Lebanon, while the Jericho oasis emerged around three water springs fed by water streaming out of mountain rock formation exposed to the Jordan Rift Valley, which coincided with where soil flowed down from the west bank mountains. Similarly, the desert city of Beersheba emerged above ground water from the southern Hebron mountains aquifer, which flows towards Wadi Gaza close enough to the surface for easy extraction. The ancient city of Hebron itself grew around water springs that flowed within its 4 hills. In drier parts of the region, such as the Gulf (comprising Saudi Arabia, Kuwait, Qatar, Bahrain, and the United Arab Emirates), water scarcity made city growth more challenging. Abu Dhabi, for example, was settled after one freshwater well was discovered on the island. The well was so precious that it was protected by a fort, now known as Qasr Al Hosn. Further inland in Abu Dhabi, the oasis town of Liwa’s existence is attributed to being above the least saline groundwater in the UAE. Similarly, Doha and Medina both emerged around a number of wells that supported small populations. But even in the dry Gulf subregion, there were exceptions to the groundwater oasis settlment model. Riyadh and its predecessor Der’eyah, grew on the banks of the Wadi Hanifa stream, which supported a population of almost 30,000 before the discovery of oil. Jeddah and Muscat both emerged on a narrow flat strip between a mountain range and a sea, making the most of the seasonal stormwater drains, but at the cost of occasional flooding. The Sana’a basin – in which the namesake city is located – is more than 7000 feet above sea level and is surrounded by higher mountains and a volcanic field, giving it two short rainy seasons, groundwater, and a fertile soil. Then there are the Egyptian, Iraqi, and eastern Syrian cities, which grew on the banks of large transnational rivers that originate in plateaus outside of the region. The Nile, the Tigris, and the Euphrates each provided enough water for cities such as Cairo, Mosul, Baghdad, and Basrah to overcome occasional droughts, and have ensured continuous civilization along these river valleys since antiquity. They also provided enough mud deposits for agriculture. Here, too, the cost has been regular flooding, until dams were build along these rivers. Growth of groundwater-based centre pivot irrigation in Saudi Arabia between 2000-2010 before being scaled back. Copyrights: Google. With the exception of the cities along these three large rivers, water has remained a limited resource, and the region could only sustain a limited population size. So as its population grew, and their standard of living increased, demand for water rose and natural water resources were no longer sufficient to meet demand. In the 20th century, population growth accelerated at such a rate that regional cities could no longer live within their sustainable environmental boundaries and additional water sources had to be found. In just 50 years the population of the region more than tripled, rising from 97m in 1960 to 351m in 2010. With limited rainfall and ground water, and newly found oil wealth, the Gulf sub-region turned towards desalination to keep up with demand. Rapid population growth in cities such as Riyadh – now 190 times larger than it was before the discovery of oil – may have justified a decision across the oil rich region to use some the oil to “manufacture” potable water. It can also be argued that it was desalination, and the availability of “easy water”, that made such population growth possible, which in turn, created a need for more desalination. The result was a demand cycle that is hard to break. Either way, desalination remains a major component of water supply in the region today. It is currently estimated that 70 per cent of the world’s desalination capacity is in the Gulf sub-region, and the wider region is generally considered to have spearheaded advances in desalination technology. This focus on desalination came despite its high energy costs. The International Energy Agency estimates that desalination in the Gulf represents approximately 12 per cent of the region’s total energy use. Saudi Arabia alone burns 1.5m barrels of oil every day to desalinate water, an amount equivalent to the daily oil consumption of Italy. Similarly, the Emirate of Abu Dhabi uses over half of its domestic energy to make potable water. Ironically, given the water needs of the oil industry, many of the Gulf states find themselves in a situation where they need to burn oil to make water, which they then use to extract more oil. The Gulf countries have also tapped into their ground water reservoirs. These are non-renewable fossil aquifers and, soon enough, this approach proved unsustainable. Ground water withdrawal over the last 30 years in the UAE has caused the fresh water table to drop by a meter, a rate which risks the complete depletion of UAE ground water within the next half a century. Similarly, after its ground water withdrawal reached alarming levels, Saudi Arabia recently had to scale back its wheat self-sufficiency program. It is estimated that by 2016 it’ll rely on importing 100 per cent of its food. Other sub-regions have decided to live within their means – but only relatively. They’ve largely accepted that per capita water resources will inevitably dwindle as their populations grow, but still occasionally tap into their non-renewable ground water. The most extreme case of such tapping is Sana’a where a mix of rapid population growth and excessive ground water use saw its water table dropping by 2 meters a year. The Yemeni capital is expected to be the first city in the world to run out of economically viable water supplies, potentially by 2017. An equally extreme case is Beirut, a city located in one of the most water-rich countries in the region and whose name can be traced to the ancient Semitic word for well. With rapid population growth, Beirut has witnessed increasing rates of ground water withdrawal. As withdrawal exceeded ground water replenishing rates, seawater flowed in, contaminating ground water and rendering it non potable. Even Egyptian and Iraqi cities, which have historically enjoyed abundant water, are facing challenges. Egyptian per capita water availability is expected to reach severe scarcity levels (set at 500m3 per capita per year) by 2025. Despite access to half of the Nile’s water, Egyptian cities’ demand for water currently outstrips supply by 27 per cent, and population growth is expected to trigger shortages. Iraqi cities, on the other hand, appear less at risk, as they are only expected to reach water stress levels (1500m3 per capita per year) by 2025. Yet this change represents a 25% reduction of per capita water availability, the steepest drop across the region. Considering all the different water sources available, the region’s overall supplies remain quite low, averaging just 1076m3 per capita per year, just over the scarcity threshold (1,000 m3 per capita per year) which identifies where a country’s water availability represents a barrier to development. In fact, most of the region’s countries have water availability below the scarcity level. The world average is 8,500m3 per capita per year. Yet despite this scarcity, and the high cost of water desalination, water in the Middle East remains relatively cheap. As a result of heavy government subsidies, the final consumer – be that industry, agriculture, or households – is unaware of the true cost of water: something that has dis-incentivized the introduction of water efficiency measures across most of the region. The region has the second lowest water productivity levels globally, generating less than $7 of GDP for every cubic meter of water used. The elephant in the room here is the 1.5m km2 of agricultural land which represent the region’s agriculture sector. It represents 7 per cent of the region’s landmass; but accounts only for 85 per cent of water consumed, compared to 70 per cent globally. This disparity is partly attributed to the sector’s reliance on inefficient irrigation techniques such as flooding and furrow irrigation, rather than micro irrigation techniques such as drip irrigation. With the exception of Israel and Jordan, most of the region’s states have failed to shift their agricultural systems towards water efficient irrigation techniques. A Solar Powered Oasis or an Abandoned Oasis? Future scenarios of the region’s cities all appear challenging, but they are not necessarily doomed to an unsustainable future. To meet growing demand, they’ll have to work on both securing sustainable water supplies and on managing demand. But they’ll need to do this in the context of population growth, conflicts and climate change. Given the region’s population growth rate, per capita water availability is expected to fall by half by 2050. In addition, climate change is expected to shift rain fall patterns: total rainfall is expected to drop by 20-30 per cent by 2070. Desalination also comes with significant risks, and the cities of the Gulf are particularly vulnerable to supply shocks. Doha, for example, is estimated to have just three days’ water supply, and is currently building a strategic reservoir that will raise this to a week. The desalination process is causing environmental damage, too. It is thought that desalination has increased the salinity of the water in the Gulf itself by 2 per cent over the last 20 years. What’s more, an average of 75 per cent of the region’s surface water originates outside it. That leaves it vulnerable to future resource conflicts. One way to achieve sustainability and water security in the region would be to fully embrace solar desalination. That would allow cities to leverage solar energy, the region’s most abundant renewable energy source. This option would require significant infrastructure investment – an investment that many cities may feel uneasy about paying for. But if the long term future hangs in the balance, such investment may be the difference between an abandoned oasis and a sustainable one.